meet in venice on may 9th 2019! 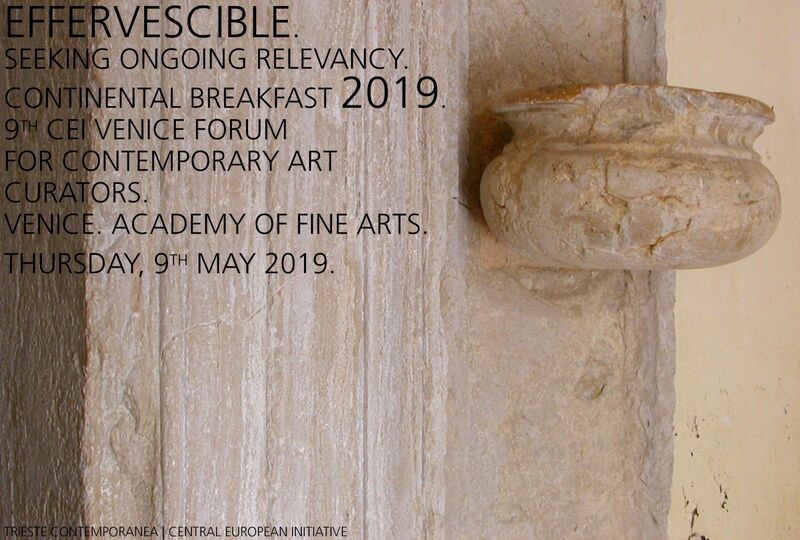 9th CEI Venice Forum for Contemporary Art Curators from Central Eastern Europe. In the spirit of creating a preview-map of what will be of relevance in the context of contemporary debate in the arts in 2019-2020, and thus collecting ongoing curatorial concepts/activities/proposals in this two year period from the international curators present at the meeting, the 9th CEI Venice Forum for Contemporary Art Curators will be held at the Academy of Fine Arts in Venice on Thursday 9th May 2019, 2:30 – 6:30 pm. Since 2003 the Forum has been a CEI Feature Event, under the patronage of the Central European Initiative. It is a biennial moment of encounter and exchange of curatorial practices among curators of contemporary art in Central Eastern Europe. The 2019 Forum will bring together national commissioners of the Biennale, museum directors, international art curators, contemporary art organisers, young curators and key figures for contemporary art institutions. The Forum will consist of a series of contributions (in English, 10 minutes) in which speakers will tell the audience from which point of view they are looking at the facts of today's contemporary art and will explain why, in their opinion, this point of view is important to deal with nowadays. They will suggest artists who they are particularly interested in. They will point what they consider currently effervescible, what are significant new trends. They will also share what ongoing action they know they would define as good public policy for contemporary art and what in their opinion should not be over looked. An in-depth section will be dedicated to Commissioners/Curators of the Biennale, which will discuss their choices for the 2019 Pavilions and illustrate invited artists’ works. Attention will be paid to desires and curatorial approaches by some newly appointed museum directors. Also, a CALL is open until 21st April 2019 for selecting 6 young curators willing to participate as speakers in the Forum and give the audience their views on the art world to come. The Forum is a CEI Feature Event and a Continental Breakfast project. | It is conceived and organised by the Trieste Contemporanea Committee in cooperation with the CEI-Central European Initiative and in collaboration with the Academy of Fine Arts in Venice. | The event is being held under the patronage of the Regione del Veneto, the Trieste Town Council, the Ca' Foscari University and the Academy of Fine Arts in Venice, the University of Trieste. | It is supported by the CEI, the Autonomous Friuli Venezia Giulia Regional Council and the BEBA Foundation of Venice. | Special collaborations in Venice: Juliet Art Magazine, Compagnia della Vela. A second CEI Forum session will be held in Trieste at the Studio Tommaseo on 25th October 2019.